﻿Paddy Power offer an extremely generous sign-up bonus to new players. In addition to a £30 free match bet, new customers will also receive a £5 free bet every week. They'll also throw in £5 completely free. If you live in the United States your choice of sports betting app is limited as none of the big European bookmakers accept players from the USA. Thankfully Bovada Sports have developed an app to closely resembles the major bookmaker apps in terms of design and functionality. It is easily the best app currently on the market for U.S. citizens. When you place your first sports or horse racing bet with Bovada via either their smartphone or tablet web app, they will reward you with a $25 dollar free bet. New customers also receive a 25% initial deposit bonus up to $250. Every Bodog Sports player who reloads their accounts on either a Thursday or a Friday will receive an additional 5% bonus on top of their deposit. Horse racing fans in the United States are also well catered for with a daily rebate of up to 8%. SportsBet are an Australian online bookmaker who have been in operation since 1993. To keep betting fun by offering their customers a variety of special betting offers, promotions and competitions. Once you join SportsBet Australia they'll match your first bet to the value of AUS $150. Every time you refer a friend to SportsBet, you will receive a $100 free bet. To make this as easy as possible for you, SportsBet provide a special e-letter service that you can use to invite/entice all your mates to take advantage of a special sign-up bonus. SportsBet also run the widest variety of money back specials for the AFL, horse racing, NRL, English Premier League and A-League. SportsBet is also home to the richest free tipping competition in Australia. Register your tips and be in with a chance to win between $10,000 and $100,000 cash on AFL and NRL games. Free bets are a great way to boost your bankroll without you having to spend any extra cash. The competition is so fierce between the various online bookmakers that virtually all of them now offer some kind of a sign-up bonus. Most of the major gambling websites will either double your initial deposit or your first wager. Over the years we've built up an excellent relationship with most of the main operators, which makes it possible for us to offer enhanced and exclusive free bet offers that you won't find anywhere else. FREE BETS & OFFERS F.A.Q. In this section we'll do out best to answer some of the most common questions relating to free bet offers and promotions. If you can't find an answer to a particular question you have, please visit our Contact page and send us an e-mail. 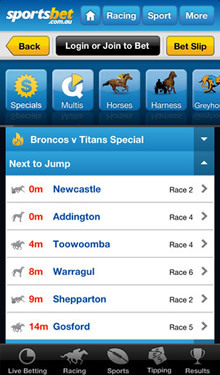 Why do iPhone and Android bookmakers offer free bets? Like any online business, gambling companies are eager to entice new customers to register and start using their services. There is little doubt that sometimes these offers backfire and bookies end up losing large amount of money. They have don't the math and are counting on the fact that some new players will stick with them for years, giving them the opportunity to earn back the money. Are there any free bet offers open exclusively to mobile customers? Yes. Some bookies like Bovada Mobile offer their iPhone, Android and Windows Phone customers additional free bet offers that are not available to their online players. Mobile gambling is the main growth area for these companies so they are particularly interested in attracting anyone who has just acquired their first Samsung Galaxy, Blackberry or Motorola smartphone. How do I claim my free bet? There are a number of free bet offers open to new sports bettors so we'll try to deal with the main ones here. Deposit Match Bonus - Some bookmakers will match or double your initial deposit providing you meet certain criteria. For instance, if you deposit £100 you will be entitled to an additional £100 in free bets. However, this bonus cash will generally only be released in smaller increments over a certain period. First Bet Match - This offer is a little more straightforward. Basically if you bet £20 on a particular team to win, the bookmaker will double the amount so your stake will actually be £40. Free Play - This type of offer is favored by United States online sportsbooks. In this instance, if you place a $25 bet on a particular team and you lose the bet, the sportsbook will refund the full amount. You can only use the free play money to place another bet and it cannot be refunded. 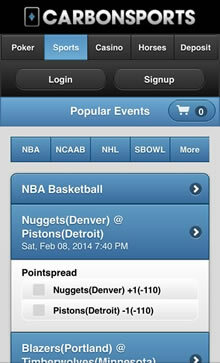 How can you offer better deals and promotions than other sports websites? We are one of the oldest and most popular websites in mobile sports betting and we've earned the trust of all the major sports operators over the past 6 years. As a results, we've been able to negotiate better deals for your readers, which means more money in your account.